A custom 2.75 x 1.875 house round corner full color magnet is a best bet for any real estate advertiser who wishes to converse with their prospective clients in a striking way. 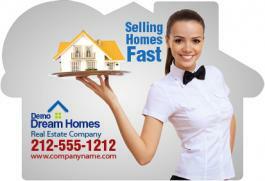 A promotional 2.75 x 1.875 house round corner full color magnet is usually employed for real estate marketing by lending agencies, real estate agents, land developers, loan payoff charts, referral programs, and area listing agencies. A personalized 2.75 x 1.875 house round corner full color magnet lures everyone with its affable shape and it is mostly retained around homes as a reference token or as a refrigerator art!